Testa-Rossa DVD replication UK services can be used for DVD video and DVD ROM. CD replication and DVD replication is a high quality cost effective manufacturing process for orders above 500 units. The replication begins with the creation of a glass master, the glass master is then used to produce a stamper. All subsequent copies will be pressed using this metal stamper disc. This DVD manufacturing process ensures all replicated discs are identical copies of your master and is the process used for DVD manufacture of all retail DVD videos. With our all inclusive DVD replication offers we can finish off your order by adding DVD disc print, inlays, booklets and packaging as required. All prices on this page include glass mastering, DVD replication, on disc print and free UK mainland delivery for orders over £500. Prices assume customer supplied artwork designs to our required template specifications. 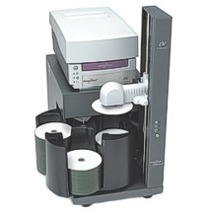 For faster production orders of less than 500 DVDs please see our DVD Duplication page. All prices listed on this page exclude VAT. Our lowest priced replication deal. Discs are bulk supply on shrink wrapped spindles. Prices include replication and on body print. We offer lower prices on larger quantities. A popular cost effective solution for promotional mail outs, software updates, DVD ROMs etc. Prices include replication, on body print, disc inserted to clear plastic wallet. Larger order quantities are available at reduced unit cost. A cost effective solution for promotional mail outs, software updates, marketing material, DVD ROMs etc. where a strong durable case is required. Prices include replication, on body print, disc inserted to clear clam. Larger orders available at reduced unit cost. Perfect for covermounts, promo and marketing. We can assign one of our EAN-13 barcodes to your product free of charge. There may be an artwork amendment charge of £15 to add the barcode to your artwork. Please leave a white box 3cm by 1.5cm on your artwork if you require a barcode. For DVD replication there are a variety of disc on body print options, all print options give a very high quality, durable finish as found on all retail DVDs. If you require advice on the best print method for your artwork please email a PDF copy of your disc artwork. More details on disc print options can be found at our on body disc print page. Please ensure your DVD master plays or performs exactly as you require it to. Replicated discs are identical bit for bit digital copies of your master. For instance if you require your replicated DVDs to play on PC, Mac and standard DVD players then your master must be suitably produced to achieve this. For DVD videos check that your master has the correct region settings etc. Testa-Rossa can only replicate the DVD master you provide us with, we cannot edit or alter your master in any way. Production turnaround for DVD replication orders is 11 full working days from receipt of master, artwork, artwork approval and payment.